In 2001 Envar became an ISO 9001 certified company. Since that time we have maintained our internal and external auditing processes to ensure uninterrupted recertification of our Quality Management System. Envar monitor and assess quarterly KPI’s such as warranty calls, staff turnover, unproductive time, incidents and injuries. This accreditation covers all aspects of our business including design, construction, maintenance, fit-out, and fabrication. In 2013 Envar raised their safety standards to incorporate a fully certifiable safety management system. The system was implemented and a subsequent audit took place under the WorkSafe Plan scheme. 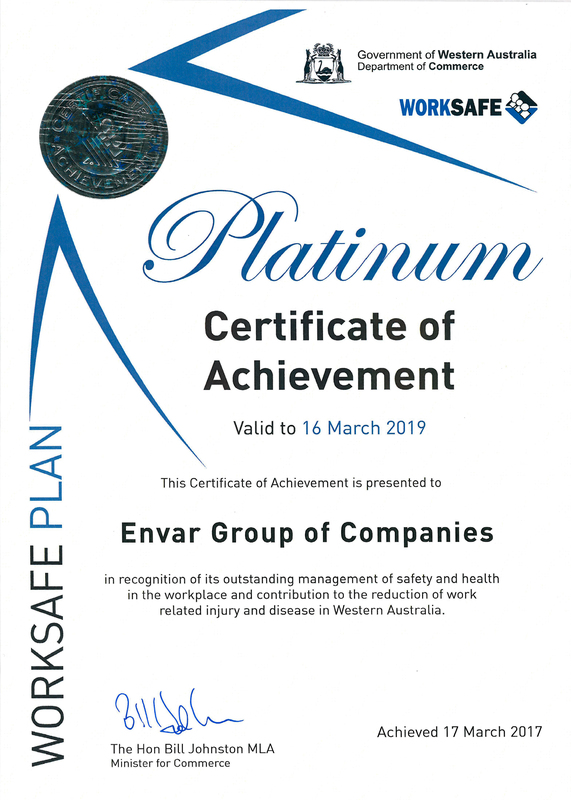 Envar was awarded the WorkSafe Platinum Certificate of Achievement for our accomplishments in OHS and the safety system itself. In January 2015 and January 2017 Envar went for re-accreditation and achieved the same standard on both occasions, this is something we are very proud of at Envar. Since the time of this award scheme being in place there has been no other Mechanical Services Provider, under WorkSafe WA’s jurisdiction, whom has achieved the Platinum standard. We regard the work that went into achieving these accreditations as a sound business investment. The time and effort Envar put into implementing and maintaining these systems is part of a large contribution made towards achieving our company vision.